Our customers deserve the best jewelry education possible, so you they can make informed decisions. We are continually updating this page on topics including: How to care for your jewelry, How to care for your coins, How to clean jewelry, How to buy a diamond and much more. If you have a question, or would like to suggest a topic for our jewelry education section, let us know, we are here to help you. Coin Mart Jewelry has been in business for over 50 years and has over 60,000 happy customers Ð visit us today. All your jewelry items should be cleaned and checked regularly, at least three times per year. At Coin Mart Jewelry there is never a charge when we clean and inspect your jewelry. Come in today! Always purchase quality jewelry cleaner solution - it is very important not to use harsh cleaners or degreasers on your items, unless recommended to you by a jewelry professional. Many chemicals can damage precious and semi-precious gemstones, as well as weaken the alloy used in gold jewelry. Coin Mart Jewelry carries top quality cleansers if you would like to purchase some for home use. Never wear your jewelry when in a pool or spa, the chlorine and other chemicals are dangerous to your jewelry. In order to prevent damage to the prongs that hold your precious stones, be sure to only have your jewelry worked on by professional jewelers. 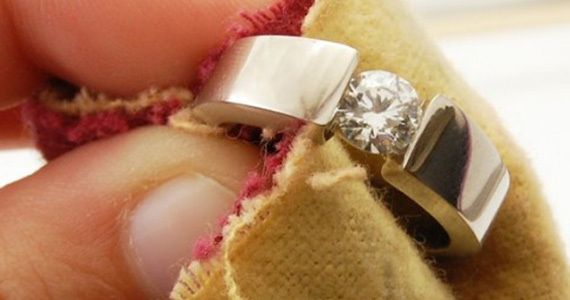 Important pieces of jewelry should always be carefully cleaned and inspected BEFORE AND AFTER work is done on them. Whether you have recently purchased coins or already have your own collection, remember to never clean or polish any coin, regardless of the value or condition you believe it to be in. Polishing or cleaning a coin will significantly decrease the value, and in some cases a coin may become worthless. Never store coins in a wet or moist area. Moisture can and will destroy coins. If you have coins that have been stored under these conditions, you should have them reviewed by a coin expert. Coin Mart Jewelry has a full staff of Certified Gemologists and Coin Experts to meet your needs. Come on in to our store, we will assess your coins at no cost! When storing coins in plastic, be sure you are using plastic cases, containers, or sheets that are non PVC (Polyvinyl Chloride) type.. PVC plastic creates a destructive chemical reaction that will eat and eventually destroy or damage metals in your coins, like copper and silver. If you choose to purchase only “certified” or “slabbed” coins, insure that the plastic around the coins has not been tampered with, is cracked, or otherwise damaged. Following these simple steps will not only protect your coins against the elements, but it will protect your investment, insuring you are getting what you paid for.